Longparish (VB093) is a large parish consisting of the hamlets of East Aston, Longparish, Middleton and Forton located along the B3048 on the north-west bank of the River Test. Whitchurch is 3 miles to the north-east. About half of the parish is farmed with extensive woodland areas, mainly Harewood Forest, in the west. Considerable use has been made of the River Test over the years with many water mills, two of which were recorded in the Domesday Book. The parish was originally known as Middleton because of its location in the middle of the settlements along the valley. The VIDLER family was one of the ancient parish families with other local families being KEELE, WEBB and WATTS. 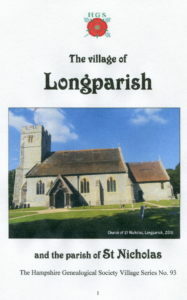 This twelve page booklet includes a great deal of historical information covering Longparish including not only the gentry but also the teachers, publicans and ordinary people. To assist with your research, useful references for Longparish documents and records held at the Hampshire Record Office are given throughout, together with other sources and website addresses for more information.